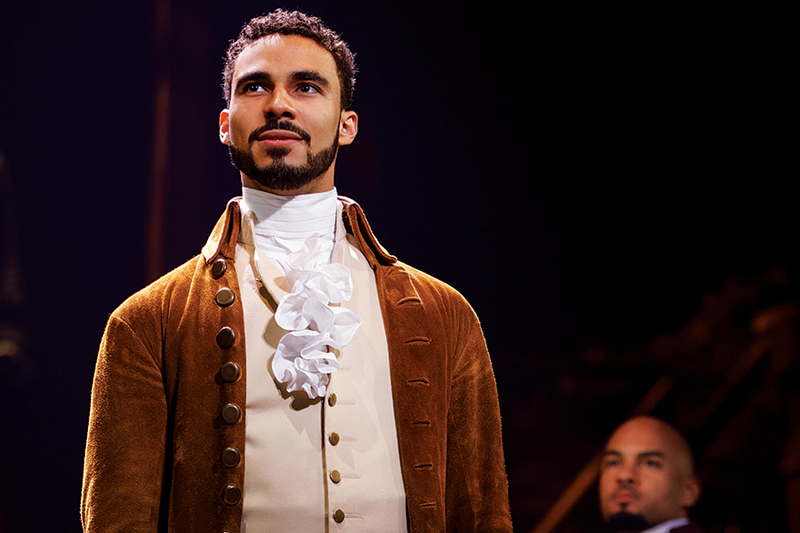 When the touring production of Hamilton (finally) makes its triumphant debut at the Boston Opera House this month, Austin Scott will take the stage in the starring role. The actor dishes on his rap skills, following in creator Lin-Manuel Miranda’s legendary footsteps, and why the hit musical is as relevant as ever. Take us back to the moment you found out you’d landed the role. It was in the middle of the day and I was on a train going to the park to clear my head and stop stressing out about getting the role. And my agents called to tell me, “You booked Hamilton and you’re going to be playing Alexander Hamilton.” And I freaked out. I jumped off the train and was running up and down the street in Harlem, screaming and asking all sorts of questions and probably crying and laughing. It took a couple of days to sink in and feel real. Audiences everywhere associate your character with the show’s creator, Lin-Manuel Miranda. How has his performance shaped yours? I never felt like they were trying to make me sound or act or look more like Lin. When people see me perform I don’t want them to say, “Wow, he looks or sounds just like Lin.” I want them to say, “Wow, he cared as much as Lin cared.” When I saw Lin do the role, I felt like he knew the emphasis behind everything he was saying—every single word feels important. And I think that’s a big part of Hamilton’s character, too—that he’s all about his words. He uses his words to get what he wants, to change the world. The show is known for its seriously fast-paced songs. Were there lines that you found particularly hard to nail? Every night I still have to do a lot of exercises to warm up my voice and mouth to be able to articulate the 10,000 words that are coming out at 7,000 miles an hour. But you have to get to a place where you trust all the work and that everything is in you, and you can’t really think about it. But even then, there are nights where I’ll jump up on a table and we’re supposed to begin this really long rap, and nothing comes out. Speaking of rap, can you freestyle? I used to be pretty good at it. I would do it at lunch and stuff in high school with friends, but I’m probably a little rusty now. Does doing the show in a city like Boston add extra historical significance? When I first saw my contract, I was most excited about DC and Boston for that reason: the historical importance of these two places. I’m really looking forward to saying lines like, “And what about Boston? Look at the cost and all that we’ve lost,” and actually being in the place that I’m talking about. I can’t wait to feel the energy from the crowd. It’s been interesting to watch how the show’s rise in popularity coincided with the 2016 presidential election and made it feel poignant in a whole new way. Do you still feel that undertone in the show? I think the main point of the show is the idea that when you see something that you believe is wrong or that you know you have the power to change, you can do it. And you should do it. You should stand up for what you believe in, and you should fight for what you think is right. That tone has not waned at all. I think it’s up to the audience to decide what they feel is relevant—how things happening in the world right now are mirrored in the show. But the ideas of revolution and fighting for what’s right and changing the world are pretty universal, and I think that will always be relevant.